School board members at the New Jersey School Boards Association’s Delegate Assembly on Nov. 18 adopted a resolution to add language to the NJSBA Manual of Policies and Positions, stating that the Association believes it is detrimental to students, school programs, and local taxpayers for the state to reduce projected aid to school districts after districts have been notified of their aid entitlements by the state Department of Education. The resolution addressed a situation that several boards found themselves in at the start of the 2017-2018 fiscal year on July 1, 2017. After districts’ budgets had been drawn up, some $31 million in state aid was reallocated from certain districts that were considered over-funded, to districts that were considered underfunded. Those changes, made after school budgets had been adopted, caused disruption in districts affected. The vote to approve the resolution, which was submitted by the Middletown Board of Education, was 126 to 7. In all, 141 school board delegates gathered at the Conference Center at Mercer, located on the campus of Mercer County Community College. Approximately 39 school board members attended as guests, to observe the Delegate Assembly as part of NJSBA’s Board Member Academy certification program. 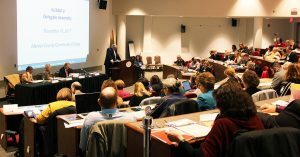 Decisions made by the Delegate Assembly become Association policy, and determine what NJSBA will fight for or against, in the state Legislature, before the state Department of Education, in Washington, and in the courts. The delegates passed the policy revision by a vote of 122 to 12. Following the May 2017 Delegate Assembly, NJSBA President Dan Sinclair had assigned the Resolutions Subcommittee the task of studying charter school policy and asked that the subcommittee report to the November DA. The assignment was made after the delegates to the May meeting tabled a resolution concerning charter school funding. That resolution, from the Edison Board of Education, was considered again by the delegates last Saturday. 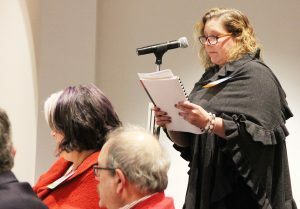 Its resolved clause called for NJSBA policy which would have stated, “The NJSBA believes that New Jersey charter schools in high quality suburban districts erode the operations of public education by draining badly needed financial resources.” On Saturday, the delegates rejected that proposed policy language. The Resolutions Subcommittee had recommended its rejection for several reasons, including the fact that existing NJSBA policy already addressed the impact of the state’s charter school funding process on all districts. Saturday’s Delegate Assembly drew nearly 200 board members. NJSBA President Dan Sinclair presided over the meeting.